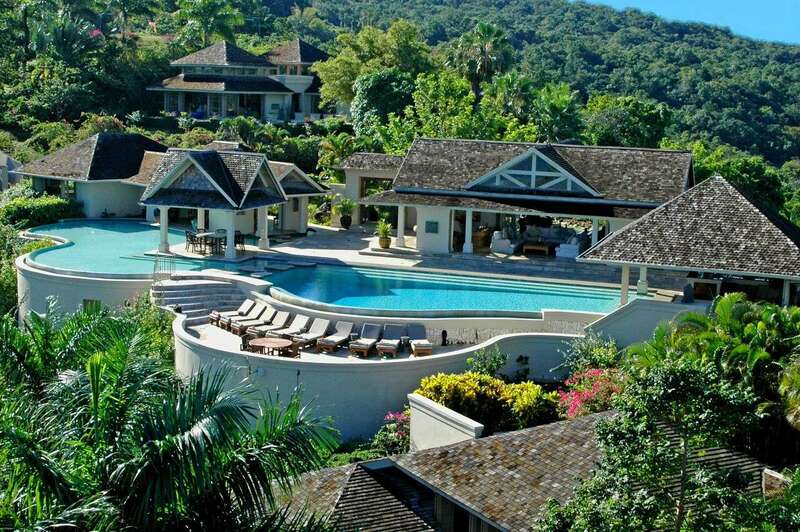 Silent Waters Villa is one of the most glamorous luxury rental villas in Jamaica. This award winning Jamaican holiday home is distinguished by world class architecture, design and decor, breathtaking location, and exquisite accommodations and service. This luxury villa rental includes the gracious staff of 14 who will cater to your every need. Silent Waters Villa is selected, perhaps more than any other private villa in Jamaica by brides for a destination villa wedding. 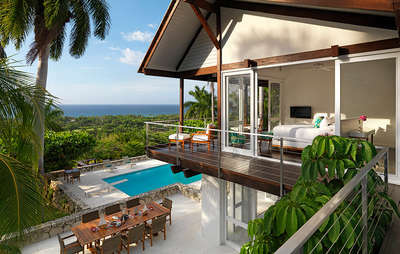 Silent Waters is located on one of the highest hilltops overlooking Montego Bay and the Caribbean Sea. The site consists of 16 and a half acres, secured with a sophisticated electronic security and video system, twelve buildings, helicopter pad, private tennis court and two swimming pools occupy five acres. Five villa suites (nine air conditioned bedrooms) accommodate as many as 18 guests. With the addition of the owner's private villa (one air conditioned bedroom) up to 20 guests may be accommodated. Each suite has its own patio with chaise lounges for sunning and relaxation, all sleeping rooms have their own air conditioner and ceiling fans, wet bar, telephone, stereo system, high speed wireless Internet service, LED high definition television with DVD player and iPod docking station. The entire property is rented to only one party of guests at any given time, thereby providing complete seclusion and privacy for the guests. Four PGA class golf courses are within a 30 minute drive. Beaches, water activities and shopping are located within a 15 minute drive from the villa. Silent Waters is a superb location for a family reunion, corporate retreat, destination wedding (seating 54 guests or cocktail party up to 150 guests) or just a small group of friends seeking a most unusual holiday experience. 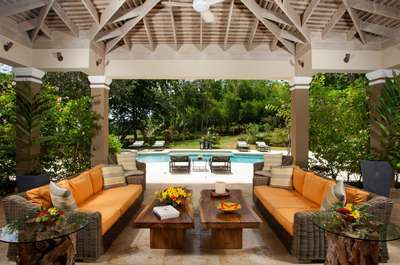 A significant amenity for guests in this villa is membership at the excellent Tryall Club. On 2 200 acres, Tryall's golf course is among the most beautiful in the world. Its 18 hillside and seaside fairways have been home to the Johnnie Walker, Mazda and other PGA championship events. The resident pro offers workshops and private lessons. The Tryall tennis club features nine nova cushion courts, some lit for night play, with world class pros on call. All white attire required. The beach is well planned for parents and children. Have lunch at the beach bar. Work out in the well-equipped gym and compete in the new Usain Bolt Games Room at the Great House (teens love it). Jog the marked trails. Snorkeling, kayaking, hobie cat and sunfish are complimentary. Glass bottom boats, charter fishing, a boat to the reef and any captained craft attract various fees. Enjoy weekly events like complimentary Manager's cocktail party on Mondays, as well as beach barbecues and reggae night beach parties for an additional fee. On the hill, enjoy the historic Great House for daily 4:00 tea and sweets. Shop at the convenient commissary and chic boutique, and meet for happy hour and snacks at the casual bar. Also at the great house is the new Usain Bolt Games Room open all day and night for ping pong, pool, air hockey, Foosball, shuffleboard, chess and checkers, board games, comfy reclining chairs and high definition television. Do not miss the massive Tryall pool. The Tryall Club is thoughtfully designed to please toddlers, preteens, tweens, moms, dads and everyone from teens to octogenarians. Linens, bath and beach towels provided. Six miles to Sangster Airport. One mile to Round HIll Resort. Five miles to Tryall Resort and Golf. Five miles to Doctor's Cave Beach. Silent Waters was absolutely amazing! Now that I'm home and back to reality I just want to go back there. The staff was so great and really took wonderful care of us. They were also very protective when we went on any excursions. It really was a dream vacation. Amazing quick service, couldn't wish for more! Fantastic experience. Communication was stellar, we thoroughly enjoyed our trip.